If a QR Code barcode scanner is needed, IDAutomation offers several hand-held QR Code imagers and verifiers. QR-Code is a two-dimensional (2D) barcode type similar to Data Matrix or Aztec, which is capable of encoding large amounts of data. QR means Quick Response, as the inventor intended the symbol to be quickly decoded. The data encoded in a QR-Code may include alphabetic characters, text, numbers, double characters and URLs. The symbology uses a small area of square modules with a unique perimeter pattern, which helps the barcode scanner determine cell locations to decode the symbol. IDAutomation’s implementation of QR-Code is based on the ISO/IEC 18004:2006 standard (also known as QR-Code 2005) and conforms to ISO/IEC 18004:2015 specifications. Fig. 1. A 2D QR-Code Symbol Generated with the IDAutomation QR-Code Image Generator. QR-Codes are commonly used with mobile and smart-phone devices to direct users to additional information about a particular topic or product. The generated QR Code asks the user if they want to open the encoded website when viewed with the camera app on most iOS and Android devices. IDAutomation offers a free QR Code URL Generator that may be used for this purpose. where T: is WPA or WEP, S: specifies the name of the network and P: provides the password. IDAutomation offers a free QR Code WiFi Access Encoder that may be used for this purpose. When a QR-Code is used in combination with a product that has an assigned UPC Code or GTIN, GS1 recommends using the GS1-QRCode format. This may be used to encode the UPC Code for POS systems and an extended packaging URL for users in a single symbol. The extended packaging URL may include additional product information, demonstration videos or a user manual for example. IDAutomation offers a free GS1 QR Code Generator that may be used for this purpose. Whether to use the GS1 format or not depends on requirements of GS1, your trading partners and the supply chain. When in doubt, contact your local GS1 office for more information. Encoding vCard contact information (in MeCard format) on business cards is also a common implementation. The image to the right demonstrates the options available after scanning the barcode in Fig. 1 above with a smartphone app. The chart below lists other common encoding technique. The Free MeCard QR Code Generator may be used to generate all codes described below. Simply copy the example below into the Free QR Code Generator replacing the generic information with yours. NOTE: Symbols created with the MeCard format only work correctly when scanned with an app that is MeCard compatible, such as the Free BeeTag iPhone app. QR-Code may also be easily displayed on smart-phone devices in place of anything that is normally printed with a barcode, such as coupons, tickets and passes. When used in this way, the QR Code is displayed on the screen via a website, email or text and scanned from the screen. The IDAutomation 2D USB Scanner quickly performs scans from mobile phone screens as seen in this video. 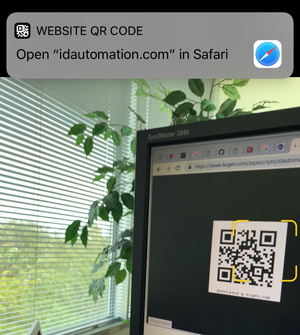 IDAutomation offers a Free QR-Code 2D Barcode Image Generator, designed to encode a MeCard business card barcode or URL, which can encode up to 200 characters. Capability to encode more than 200 characters is available in the products described below. The IDAutomation QR Code Barcode Font and Encoder is a collection of encoders and components that generate QR-Codes with either fonts or graphics. Several types of QR Code encoders are available in the package to support multiple operating systems including Windows 32 and 64 bit systems, Mac OS X, Unix and Linux. This package includes the IDAutomation_QRFontEncoder(DataToEncode) function to easily generate symbols from VBA code in Microsoft Office and VB code in OpenOffice in addition to support for development environments including .NET, Java, C#, VB and C++. QR-Code is also offered in several barcode components, such as the Crystal Reports Barcode Generator, .NET Windows Forms Control, ASP.NET Server Control and Streaming Server for IIS, as well as the 2D QR-Code Image Generator for Windows and the Barcode Label Software Pro. QR-Codes are some of the smallest and most dependable barcodes in use today, however, they are generally not as small as Data Matrix and Aztec symbols. QR-Code is also a good choice when sending barcodes over faxed documents, because the symbol can withstand many poor resolution and scanning issues, especially when using IDAutomation’s 2D S font. According to the specification, a quiet zone of four times the size of one module is required on all sides of the QR-Code symbol. The quiet zone should be the same color as the background within the symbol. This quiet zone of QR-Code is also larger than Data Matrix, which only requires one module. Choosing the correct encoding mode and the lowest error correction of “L” (or parameter 2) will help ensure the symbol size is as small as possible. Mask Pattern Reference #7, Error Correction Level "L"
Byte 0 (Default) Encodes any data byte by byte. Alpha-Numeric 1 Encodes only numbers, uppercase letters, the space and the following symbols (&%*+-./:). Numeric 2 Encodes only numbers. Four levels of Reed-Solomon error correction are referred to as L, M, Q and H. The error correction levels allow verification of data and recovery in the event that part of the symbol is damaged. Increasing the error correction level increases the symbol size and reduces data capacity. The percentage of recovery and capacity noted below are approximate. To generate the smallest symbol choose error correction “L” or parameter “2”. * The parameter selection is the parameter to use in IDAutomation’s QR Code Font and Encoder and other QR Code Components. The version is the size of the symbol from (1) 21×21 to (40) 177×177. Zero is the automatic selection and the default. If the symbol needs to be larger than the selection, the component automatically overrides this value. Micro QR-Code symbols may also be generated with the setting of (-4) for automatic. Micro QR-Code is only available in products that support GS1 QR-Code. The size of the micro QR-Code symbol is from (-4) 11×11 to (-1) 17×17. The largest micro symbol can hold 35 numeric characters in numeric encoding mode with error correction level set to L (2). If the symbol needs to be larger than the selection, the component automatically overrides Micro QR-Code mode and creates a standard QR-Code symbol. Choosing the correct encoding mode and the lowest error correction L (2) will help ensure the symbol is as small as possible. The following is a Micro QR-Code encoding 1234567890123456789012 in numeric mode with error correction L (2). IDAutomation QR Code Barcode Fonts, Components and Applications use the tilde character “~” to recognize special characters when “Apply Tilde” or “Process Tilde” is enabled. QR Code allows ASCII codes to be easily encoded for various functions such as tabs and returns. These functions are not usually visible when scanned unless the Barcode Scanner ASCII String Decoder is used with a scanner that has lower ASCII capability such as the IDAutomation 2D Barcode Scanner with Control + ASCII mode enabled. ~1: Represents the GS1 FNC1 in first position (in supporting products). ~2: Represents the AIM FNC1 in second position (in supporting products). ~dNNN: Represents the ASCII character encoded by the 3 digits NNN. ~d065 represents the character ‘A’. The most common method of reading printed QR-Code barcodes is with a camera-based image reader (aka: barcode imager). Most of the hand-held barcode imagers recommended by IDAutomation perform keyboard emulation and receive power from the USB port so that no external power supply is needed. When a QR-Code barcode symbol is read using keyboard emulation, the data appears at the cursor as if it had been typed in from the keyboard. When reading QR-Code barcodes from the screen of a mobile device, it is necessary to use an advanced imager such as the IDAutomation 2D USB Scanner. Advanced 2D Imagers also read from LCD and LED screens, as demonstrated in this video. The IDAutomation 2D Omni-Directional Scanner reliably reads the IDAutomation QR-Code Barcode Font when printed as small as 3 points, which is an X-dimension of 10 mils. In many cases, it may be desired to have the scanner trigger a form or action in an application. IDAutomation has documented simple methods of accomplishing this task in the USB Barcode Scanner Application Integration Guide. To encode any type of data in QR Code, including files, photos, double-byte, kanji and Extended ASCII Characters, use the byte encoding mode. When reading this type of data from QR Code, ensure the barcode scanner is capable of reading and decoding bytes. With some scanners, this is only possible via the serial interface option with data bits set to 8N and special software. Normally, USB attached scanners do not support extended characters above ASCII 128, and only scan characters that are actually on the keyboard. Contact the scanner vendor for more information; some of the scanner’s internal settings may also have to be modified. The QR Code specification provides a method to encode Kanji characters directly. All IDAutomation products provide byte encoding, which is the recommended method of encoding Kanji for several reasons, including support issues. It is recommended to limit the amount of data encoded in each symbol to 800 characters or less if possible. The ISO/IEC 18004 specifications state that up to 2900 bytes and 4200 ASCII characters may be encoded in single symbol; however, few imagers can dependably decode symbols that large. The amount of data that can be encoded will vary depending upon the type of data, the encoding mode and what the scanner can read. The mask pattern determines which modules are dark and which are light to make it as easy as possible for a QR-Code scanner to decode the data. This was important in the early 2000s when matrix based decoding systems were not as advanced as they are today. With todays modern matrix decoders, all mask patterns will decode properly in nearly the same amount of time. Because the mask patterns take many calculations to compute, some IDAutomation products released after April 2016 include an option to bypass this calculation to make barcode generation faster. Denso Wave, Inc. invented the QR-Code symbology. A notification on their website states that no license or royalty fees are required provided that a proper copyright notice is included that refers to Denso Wave, Inc. as the copyright owner. Patent Infringement Claims: There have been recent patent Infringement claims (Patent Numbers: 6,199,048 8,131,597) regarding the use of “indirect links”, also referred to as “tiny URLs” embedded in QR-Code symbols. Therefore, when encoding URLs in QR-Code, IDAutomation suggests encoding the entire URL. IDAutomation provides the generation component and fonts to generate QR-Code symbols; IDAutomation is not responsible for the data encoded. This suggestion is not to be considered legal advice; IDAutomation does not provide legal advice.